This entry was posted on Wednesday, October 8th, 2014 at 12:01 am and is filed under Book Review, Volunteers' Stories. You can follow any responses to this entry through the RSS 2.0 feed. You can leave a response, or trackback from your own site. Aah! Those old skills are being lost, rather like endangered species, due to modernisation. One of my husband’s mentors from his youth was a typesetter. 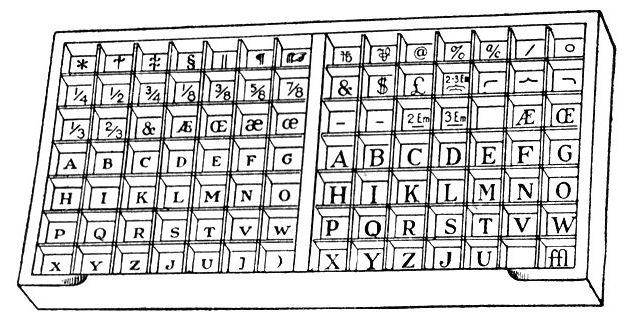 He started out with actual type, but eventually had to learn linotype. He’s the only person left in Lansing, Michigan, who knows how to operate the LinoType machine in the printing museum there! I’ve always been fascinated by moveable type, too. Thanks for the great review of the book. Just a note that I learned to type on a manual typewriter which was my Dad’s portable and no electricity and at the same time I had a class in High School using electric typewriters. OH My, how computer word processing is so much easier, though there was more control for envelopes and such with a typewriter. As an aside, I saw the moon as it was coming out of eclipse mode, and it is still shining through some clouds, with dawns early light approaching. hi all, A most enjoyable read of what was a very important trade in it’s day the apprenticeship was not a fixed time period as in many other trades and often lasted many years!